Much as I hate to say it, my expectations towards third Jagged Alliance, Jagged Alliance Back In Action, have been quite low ever after seeing first gameplay clips about the game. The game is coming out for PC 10th February 2012, which is only like few weeks apart. It's being developed by a small company called "Coreplay", which is totally unknown for myself. Gameplay video is at the end of this post. The story takes you back once again in to island of Arulco where a dictator has taken the control of the country. Those fearing big changes to the almost perfect game system of the Jagged Alliance 2 will be in for a shock. Back In Action, although gameplay wise otherwise similar to the prequel, is Real Time strategy instead of what we've used to about with the franchise -- turn based system. This may be turn off for some, and in the first preview clips that came like almost year ago the action looked quite jerky. Well it may not be all that bad, everything is still controlled by mouse clicks, and the real time gameplay is actually executed the way that you can pause any time to give similar orders, that you would give in turn based combat also. Executing them just takes place in real time when you unpause the game. This system is called "Plan & Go", thus also offering quite tactical way of planning your actions. You can still select the bodypart to hit, but at least the seen version did not offer "set accuracy" option for a shot, though it showed percentage for changes to hit with "a standard shot". Damage is presented by number after each hit. Another new thing is that the game allows you to set waypoints and build whole route of actions and waypoints, when the game is on paused state. If it works like it should, it's still quite tactical despite turn-based system is gone. Enemies do hear and see things, they can alert and run away if they see a grenade thrown next to them. Otherwise AI is big question mark at the present state of time, and will be one of the big factors about if the game's any good or not. 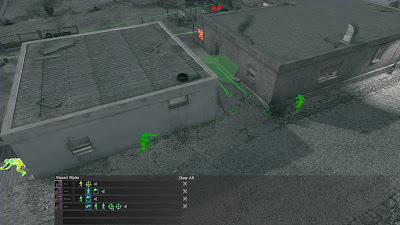 One thing I didn't like in the version I saw was that enemies not seen in the screen are presented by red dots in the edge of the screen, if they are off-screen. I'd rather prefer element of surprise rather than knowing whereabouts the enemies are and how many there is on a current map. Most of the gameplay things we're used to are still there, and other than the above mentioned things, old school fans should pretty much feel home with the system. The world map is still similar divided into sectors to conquer, which also seems to work real time though. The world is consisted of few different areas like desert, jungle, cities, hospitals, SAM sites and military bases. Making money is, like before, about conquering cities with mines, which turn the profits to your hands. By money you can recruit mercs and buy guns. 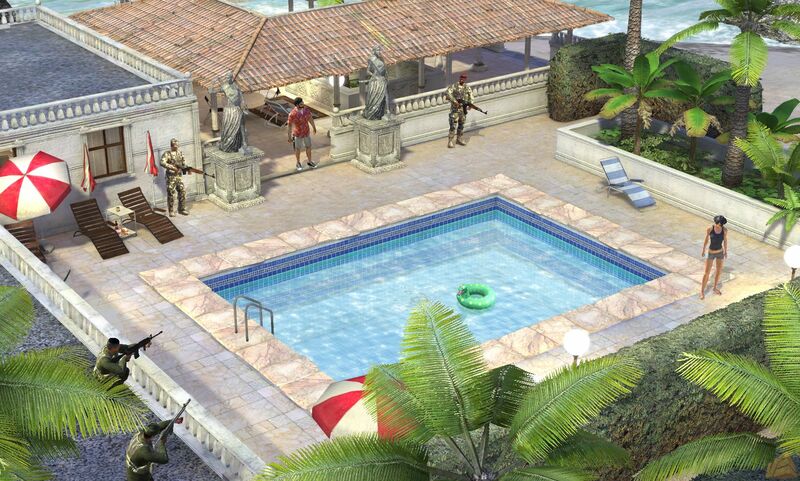 E-mail system from Jagged Alliance 2 is there, and gun merchants will notify you about the new arrivals by e-mail. Up for shopping at old good Bobby Ray's Guns and Things? There are also mercenaries scattered around the world map, as are many worthy lootable items. This should encourage you to check most houses for valuables. You may also find NPC's to discuss with, which may give you additional Quests. 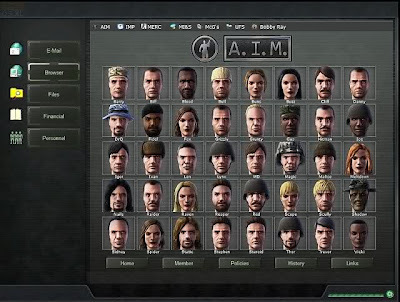 One thing that worries me a bit is that the clips never showed your own custom made character, which was one of the fun things to create in Jagged Alliance 2. The feature might be gone? The character system seems to be old school. Every each has it's own personal inventory, attributes and stats -- which seem quite the same than before. Even stealth is still existant. You still gather experience points of skills and level up, and so do your stats. The weapons and armors are various and other than from bargaining, you can find them scattered around the world or from hands of dead enemies. Like in prequel of the game, there are various types of guns, armor and explosives from C4 to Grenades (which seem largely handy by the way) -- and guns can jam up as well. There seems to be extra parts which you can add to guns, like scopes. Your mercs can get lethally wounded and die, and the role of a medic is also noticeable. They also seem to have preferences who to work with and how not to, so they might not get along with certain personas. Resting is needed to keep mercs in shape. One more thing that is new is the graphical style, which is typically for 2012 set for full 3D. The view however still is top-down. The thing bothers me most about the graphics is that they look bland and boring, and surely are not going to be the main catch of this game. It's not that I would had hoped better graphics engine or anything. Just the general style and objects style wise look bit bland. However there's quite a bit detail in the world nevertheless. It just looks a bit too much of something like Sims 2 or something. Especially character portions in 3D look really crappy. Your current armor is, if you have a helmet and sunglasses or something, also are shown in the portions. Basically if you use same items for everyone they all look alike. Mercs have their own unique spoken dialogue like in Jagged Alliance 2, but fast first look into it didn't really convince as well as in the prequel of the game. Success of this game pretty much depends of how well RTS combat system with pause & go works, how well does the AI work? How fun is the world to explore and does Back In Action offer challenge all the way up to the end game. So far AI quality is totally unknown while combat actually looks decent. The game is also said to be rather challenging than too easy, which is a good sign at least. Seeing the video below has raised my hopes "from the sewer" to actually "worth a try" level. Few mishaps are there like graphics falling bit on poor side with jerky animations, lack of nostalgic turn-based combat system, possible missing of character creation, average sounds in general and some little things. I get a feeling the game may be quite mixed bag. Nevertheless Back In Action seems to stick to it's roots in more things than I expected though -- although it may have given up one of the frahchises trademarks. The footage I've seen is from a "press preview" version so bare in mind that some things may still be slightly changed over for a final version of Back In Action.